"Making your own" food used to be almost frowned upon as something best left to the hippies (like making apple cider) but in a quest for a healthier lifestyle people make so much stuff in their sheds and kitchen these days, it's the norm. And so it is with kombucha. I knew kombucha was more than a standard health fad that would pass when the people at work started drinking it and making their own. Brewers of kombucha will still have the same ph level problems that the hippies had so if you feel you need to adjust the pH balance or 'reduce the acidity' of your kombucha culture then measuring the level is a great first step. The problems to which we refer are brews that are not acidic enough to prevent pathogens such as mold or unwanted bacteria from growing and tainting the drink. As kombucha ferments, the good bacteria produce and gluconic and lactic acid. These acids then contribute to the lowering the pH level. When freshly brewed a batch of kombucha will test at a ph level of a range between 4.5 and 4 and slowly begin to drop off. So, brewers will test the pH range to ensure they are at the right points of the fermentation process. Once primary fermentation is complete, the raw kombucha will ideally produce a pH reading anywhere from pH 2.5 to 3.7. It's good to know that the higher the pH level, the sweeter your kombucha will taste. So how do you test the pH of Kombucha brew? There are two ways you can test the pH of your batch - using a pH meter or testing with a pH strip. There are pros and cons of each - both in terms of accuracy and ease of use. The short version is if you are on a budget and have a 'she'll be right' kind of mentality then testing with a strip will get you a ballpark result. If you want an accurate result down to a single decimal place, then handheld pH testers are ideal. Fill a beaker or glass with the sample of the kombucha you are testing. Your glass must be extremely clean and free of any dirt or other contaminants that may influence the test result. Take a pH strip from the pack and add it to the solution. It will then change color. You can now compare this color change to the color chart that was supplied with your strips. For kombucha, you are looking for the yellow to light green result. If they match, you have attained the desired pH level for your drink. 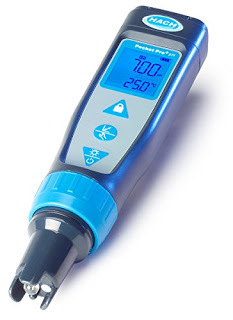 If you are dead keen on getting an accurate, scientific reading of your brew, then a handheld pH reader is for you. It has indicators for battery life (1000 hours) which means you can test your Kombucha for hours and hours! The unit features 'one touch' calibration, and shows both the parameter and temperature readings at the same time. The cap is designed to be leak-proof and can be attached to the top of the meter when not being used. Many kombucha brewers use the Hach 9532000 Pocket Pro+ pH tester to get the results they need. Instructions are found in the manual, which may be downloaded. What are you waiting for, order the Hach from Amazon! As with all pH meters, they do need calibration from time to time so you will need to use them with calibration solutions as appropriate.